Concept:This mid to late successional Vegetation Type (VT) has an overstory co-dominated by yellow birch and balsam fir, both of which are also significant in the understory. An extensive herb layer dominated by eastern spreading wood fern is also characteristic, especially in more open stands. Yellow birch – Balsam fir / Eastern spreading wood fern – Wood sorrel is the dominant VT found in the Cape Breton Highlands transition zone, an informal ecological term used to describe the area where forest conditions blend between Acadian hardwood slopes and the balsam fir plateau. Vegetation:Yellow birch and balsam fir are the dominant overstory trees. Common associates include white spruce, white birch, and occasionally red maple, sugar maple, white pine and hemlock. The shrub layer usually includes abundant balsam fir and yellow birch regeneration, as well as mountain maple, striped maple and mountain-ash. The extent and health of the balsam fir overstory strongly influences herb layer development. In more open stands dominated by yellow birch, coverage by eastern spreading wood fern can be abundant, co-occurring with lesser New York fern, evergreen wood fern and bracken. 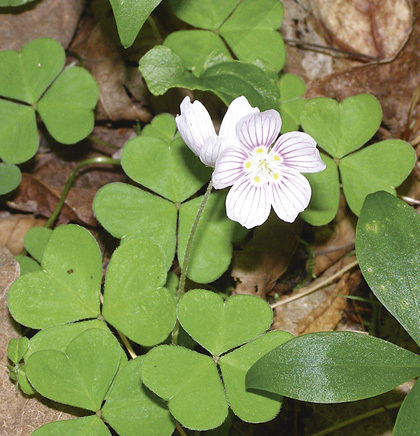 Generally common forest species like bunchberry, wood sorrel, sarsaparilla and bluebead lily may be more plentiful in closed mixedwood conditions. A moderately-developed bryophyte layer is dominated by Schreber's moss, bazzania and broom moss. Environmental Setting: HL3 is mainly associated with fresh to fresh-moist, nutrient medium to rich soils derived from glacial till and/or colluvium deposits. Richer versions of this VT occur where seepage enhances moisture and nutrient status. 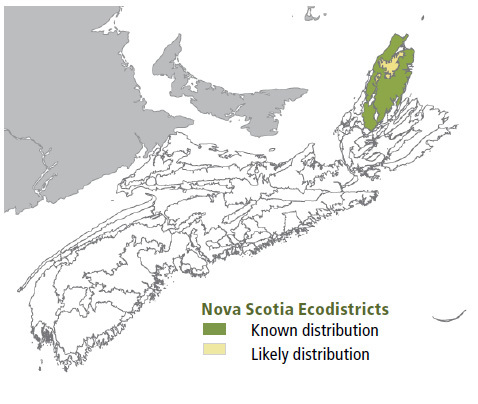 HL3 is generally confined to well drained upper slopes within the Cape Breton Highlands ecodistrict, usually at elevations ranging from 250-350 meters. Wind and exposure may significantly limit tree growth. This VT is common in northern New Brunswick and marks the northern limit of the temperate zone in the Gaspé Peninsula and other parts of Quebec. 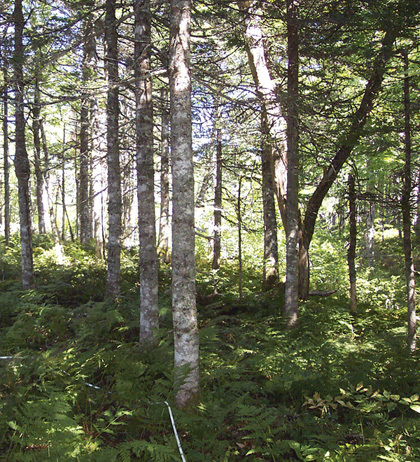 Ecological Features: This matrix forest characterizes the transitional zone between the Maritime Boreal Cape Breton plateau and the temperate hardwood slopes. Yellow birch is the province's longest-lived hardwood species (300+ years), and this, along with intermediate shade tolerance, promotes uneven-aged conditions with mature canopy. The balsam fir component is governed by spruce budworm epidemics, however in this mixed forest some fir trees typically survive, resulting in multiple cohorts with rare individuals living up to 175 years. Yellow birch in this ecosystem can grow 17m tall with diameters of 75 cm, many deformed by exposure. Large diameter, living, hollow trees provide good denning and cavity nesting sites, and continue to provide valuable wildlife habitat as large coarse woody debris after they fall. Great-horned owls may take over the former nests made by hawks or ravens in yellow birch. Songbirds such as common redpolls, American goldfinches and pine siskins eat yellow birch seeds, while ruffed grouse eat the seeds, catkins and buds available throughout the winter. These forests may provide nesting habitat for northern goshawk. Old growth potential is high. Distinguishing Features: Yellow birch and balsam fir are dominant in the canopy of this mixedwood forest restricted to the upper slopes of the Cape Breton Highlands ecoregion. The canopy extent of balsam fir is influenced by the timing of the spruce budworm outbreaks. The fern component of the herb layer is well developed with wood fern species.